Monaghan retained their Division One status thanks to a thrilling 1-10 1-9 comeback win over Donegal. 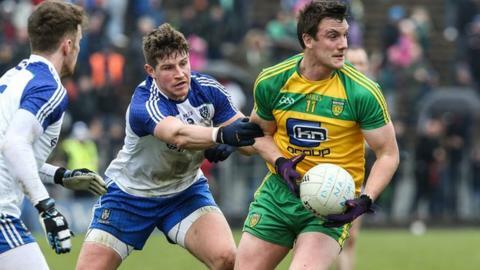 Donegal led by seven points early in the Castleblayney game but Monaghan fought back and Colin Walshe popped up with an injury-time point to win it. A superior scoring difference means Monaghan stay up while Donegal will meet Dublin in the semi-finals. Cork join Down, who were defeated 1-19 to 1-16 by Mayo, in being relegated to Division Two. Down lost all seven league games and completed a miserable campaign with this defeat at McHale Park. Cillian O'Connor converted a 20th minute penalty to help Mayo into a 1-9 to 0-10 lead at the break. Donal O'Hare slotted over four frees while Peter Turley was also on target for Down, who enjoyed a helping breeze in the opening 35 minutes. Mayo pulled clear in the second half but Down mounted a late comeback and O'Hare's goal left just a point between the sides. However, Evan Regan fired over his ninth point to seal a win which ensured Mayo stayed in the top-flight. It looked bleak for Monaghan after a Martin McElhinney goal helped Donegal into a 1-4 to 0-0 lead. The hosts hit back with Daniel McKenna netting while Conor McManus hit points as they trailed 1-7 to 1-4 at half-time. Monaghan talisman McManus brought the teams level before Kieran Hughes sent a late free just wide. It looked like being a costly miss for the Farney men but Walshe delivered the crucial point in third minute of added time. Cork, Monaghan, Mayo and Donegal all finished on six points but scoring difference saw the Rebels drop into Division Two. Monaghan defender Colin Walsh said: "We dug in, showed character and hunger and fought back to come out on the right end of it. "There was a great atmosphere and it was the sort of performance we needed ahead of the championship."